Give your fatigued feet a break with the Baby Silky Foot One Shot Peeling from Korean cosmetics label Holika Holika. 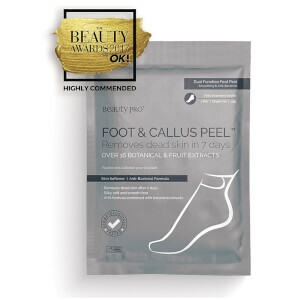 Enriched with exfoliating fruit extracts that gently buff away dead skin cells, the formula is designed to be poured into a pair of supplied ‘socks’ and left for an hour and a half while it works its magic, leaving you with silky smooth, soft feet and heels. Use as meias em ambos os pés. Abra ambas as saquetas e verta a fórmula em cada meia. Deixe atuar durante 90 minutos e tire as meias. Lave os pés suavemente com água. Water, Alcohol, Lactic Acid, Sodium Lactate, Glycolic Acid, Glycerin, Arginine, Phenoxyethanol, PEG-60 Hydrogenated Castor Oil, Salicylic Acid, Fragrance, Disodium EDTA, Urea, Lavandula Angustifolia (Lavender) Extract, Rosmarinus Officinalis (Rosemary) Leaf Extract, Mentha Piperita (Peppermint) Leaf Extract, Cocos Nucifera (Coconut) Fruit Extract, Citrus Aurantifolia (Lime) Fruit Extract, Citrus Medica Limonum (Lemon) Fruit Extract, Pyrus Malus (Apple) Fruit Extract, Citrus Aurantium Dulcis (Orange) Fruit Extract, Vitis Vinifera (Grape) Fruit Extract.